Jeans are must haves in people’s wardrobe, but do you know how to select and wear jeans right? That means to create a stylish look with jeans and most importantly don’t make you look short in jeans. And that’s a problem which i want to talk about. In real life, to be frank, not every girl has that perfect super model legs. 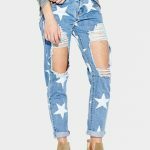 Therefore, if you are not very careful of the selection of women jeans, it may turn out to be a failure and a bad presentation of the imperfections of your body. So you need to choose proper jeans according to your own figures. 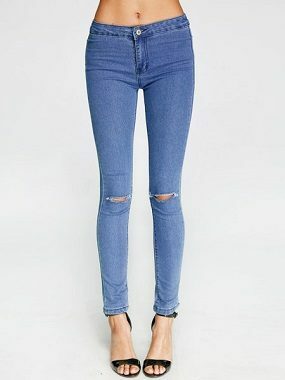 One of the dressing trick is to wear stylish high waisted jeans especially for petite girls. But there is one thing you must remember is you’d better tuck the bottom of the top into the jeans, and that will lift your waistline and thus stretches your legs visually. As for the tops, you are free to choose sweaters or T-shirts or something else you like. All of them are very chic to go with high waisted blue jeans. Besides, cropped high rise jeans and ankle boots are really very chic pair. You can also put one more belt on if you want. And that will highlight your waistline and give you better proportion. To go with them, a short coat would be wonderful and stylish. What’s better is, in this case, even petite girls don’t have to worry about whether it will make them look short if they wear flat shoes. That’s because short tops and cropped high rise jeans will give you a wonderful body proportion and stylish look as well. And in spring, an off shoulder top and cropped high rise coupled with high heels can be very charming and elegant, which is highly recommended in the matches of jeans.